A gosh darn barn right here in Downtown Fullerton! 20 years ago the buildings at the SE corner of Harbor and Commonwealth burned down under strange circumstances, including what was left of the Sterns and Goodman store (why do historic structures keep burning down in Fullerton?). 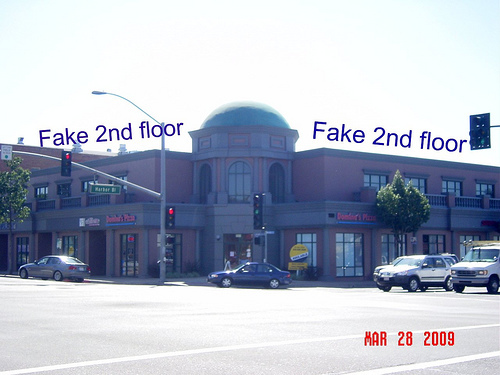 Unbeknownst to the good folks of Fullerton, perhaps the worst example of Redevelopment ineptitude was about to begin. The owner of the property, Pierre Nicholas, proposed to build a bank building on the corner – a suitable use for the 100% corner any reasonable person would have to agree. But not the entrepreneurial geniuses who ran the Redevelopment Agency at the time – Terry Galvin and his boss Hugh Berry. The problem? Banks don’t generate any sales tax revenue and that’s what Redevelopment is all about. At one hearing a defensive Councilmember Buck Catlin exclaimed “they wanted to build a bank” with the same tone of disgust one might mention a whorehouse or an opium den. And so Friends, the City embarked on a course to acquire a lengthy ground lease to prevent the owner of a property to develop it the way he wanted . Nicholas went along. Why not? Income with no effort on his part. The Redevelopment bureaucrats already had their favored developer lined up – Sanderson/J. Ray (from Irvine! )who, in cahoots with the City, had worked out a deal with Knowlwood Restaurants to occupy a restaurant on the southerly part of the site. The subsidized Kwowlwood was eventually ground out of the Redevelopment process – a barn shaped object clad in stucco and brick veneer (pictured, above). Yeehaw! Meanwhile the development of the corner languished as the developer was finding tenants, and presumably a loan, hard to come by during the early 90s recession. The developer did get permission to put parking lot on the corner and just added insult to injury. The 100% corner – a parking lot! The roof is a giant bowl! This is not a joke. Just check out the picture below if you can’t believe it. The City’s heretofore 5 year saga was reduced to this sort of comic charade. Lights were placed on the floor of the area directly behind the windows to make it look like there was real space up there. To top off the irony, the designer of this mess actually got offended by the suggestion that the geraniums in the second floor planters be plastic to save water! 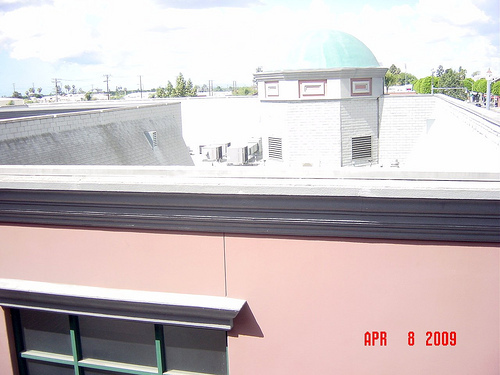 By the time the building was built and occupied 7 long years had passed – 7 years of lost property tax, and the addition ludicrous new buildings that never should have been built in the first place. 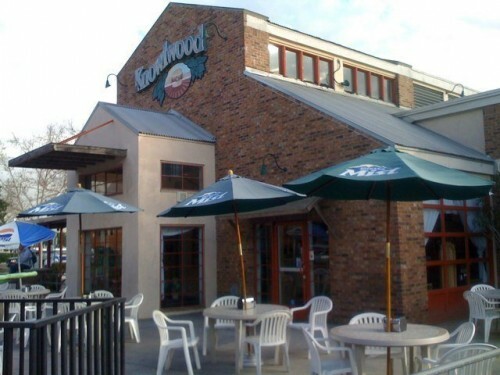 For many Redevelopment watchers “Knowlwood” has become synonymous with Redevelopment boondoggles. Oh well! As Molly McClanahan was once heard to say: hindsight is 20/20! An excellent motto for the Fullerton Redevelopment Agency. did a little back yard digging and saw good golly miss molly mcclanahan bought her degree at U of redlands popularly known as pay the fee get a b university. 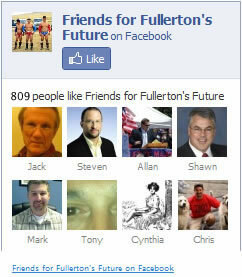 she joins the ranks of other famous u of redlands alumni disgraced sheriff carona of orange county. are there other public servants who are alumni of u of redlands? these academic imposters are foisting their ignorant leadership on the unsuspecting tax payer? big box, if in fact your facts check out, that’s a big surprise. Her love of crappy micky mouse architecture makes me wonder if she went to school at all. anonymous, the fact that she went to u of redlands is proof she doesnt have an education. The Knowlwood saga is over, although we’re still stuck with the brick veneer farmhouse.